Names List Spreadsheets Are Dead! What do these organizations all have in common? If you said “they’re great recruiters” you’re mostly right. Dig a little deeper. HOW do they recruit? If you said “year round … values based … culture fit ….” you’re mostly right again. Try one more time. HOW do they recruit? If you said “using a spreadsheet” you would be 100% wrong. Spreadsheets are dead! I’ll say that again. SPREADSHEETS ARE DEAD. Top performing organizations/industries have upgraded their technology. They recruit smarter. They use Customer Relationships Management (CRM) software specific to their industry and audience. Most of the organizations listed above made this switch 10-20+ years ago. When they did, it changed the way they do business. As soon as one organization changed, all the others in that industry had to change to keep up. Today, none of these organizations could even imagine managing their customers, leads, members, voters, recruits, prospects … with a spreadsheet. Ask them. They’d look at you like you’re a crazy person to suggest that they could. They’ve been transformed, upgraded forever. And, they’re better because of it. GOOD NEWS!!! The same technology revolution has arrived in the fraternity/sorority space. A major technology upgrade called ChapterBuilder is changing the way fraternity/sorority recruitment is done. GREAT NEWS!!! The ChapterBuilder technology was developed by TechniPhi in collaboration with the Phired Up team of recruitment experts. This is easy-to-use, professional grade software built by fraternity/sorority experts for every fraternity/sorority chapter that shares our commitment to making Greek Life bigger and better by recruiting higher quantities of higher quality people. Oh yeah, one more little detail. IT’S FREE. $0. No Money. Every fraternity/sorority chapter in the country already has an account. All they have to do is activate it. Yes, this is crazy. Yes, this is awesome. Within 2 years, saying that your chapter/community recruits from a spreadsheet will be worse than admitting you have an active MySpace account. O.K., fall recruitment is FAST approaching, and since it is August you’re starting to get serious about building a plan. You’re thinking, “I HAVE A CALENDAR OF RUSH EVENTS, I’M GOOD.” Well, that’s a great start. But it’s a calendar, not a plan. People join people, not events. So you need a simple plan to get your chapter’s people in meaningful relationship-building opportunities with the people who you want to join. The first thing we recommend you do as you’re preparing for fall recruitment is determine WHY it matters to put hard work into recruitment. Truthfully, for many chapters, just enough guys normally show up to recruitment events without much effort. So, you can just phone it in, right? Order some T-shirts, repeat the events from last year, boom. Well, yes. You can probably survive just fine without trying too hard. But here’s why we’ve dedicated a whole career to fraternity recruitment — because if you recruit the right men, fraternity can be a powerful force for good. We can change the world, and we can change lives. There are probably hundreds (if not thousands) of men on your campus who need fraternity in their lives (like I did and you too, I’ll bet). Recruitment is life changing and world changing. Recruitment is what fraternity is all about — giving the gift of brotherhood and purpose to high quality men so that they can gather together and do incredible things. The most important task you need to fulfill to build a recruitment plan, is determine how you will MEET as many non-Greek students as possible. You need some tactics to fill up your Names List. This is an easy problem to solve. We recommend picking about 5-7 of your favorite ideas from this list, spread them out over the first few weeks (do 3 in the first week, then 1 or 2 for the weeks following that), and execute them with excellence. These matter a LOT. You don’t have a chance to recruit people unless you first meet them. You already know this, but people don’t join organizations… people join people. Recruitment is entirely a relationship business. So have a plan to manage and build relationships. The first thing you need is a smart Names List. A technological tool that makes it easy to record, track, and manage the hundreds of men you’ll be meeting through recruitment. We’re not talking about a spreadsheet here. Spreadsheets are dead. Use ChapterBuilder. It’s free, it’s built for chapters who follow our Phired Up recruitment model, and it is absolutely amazing. Next, make sure you aren’t ONLY building relationships with prospects during “big events.” Big events are fine, but they’re really built for people who already know you — otherwise they can be intimidating for high quality men to just wander into. Fill your first few weeks of school with Small Activities. Selecting members might be the most important (and least focused on) aspect of fraternity recruitment. 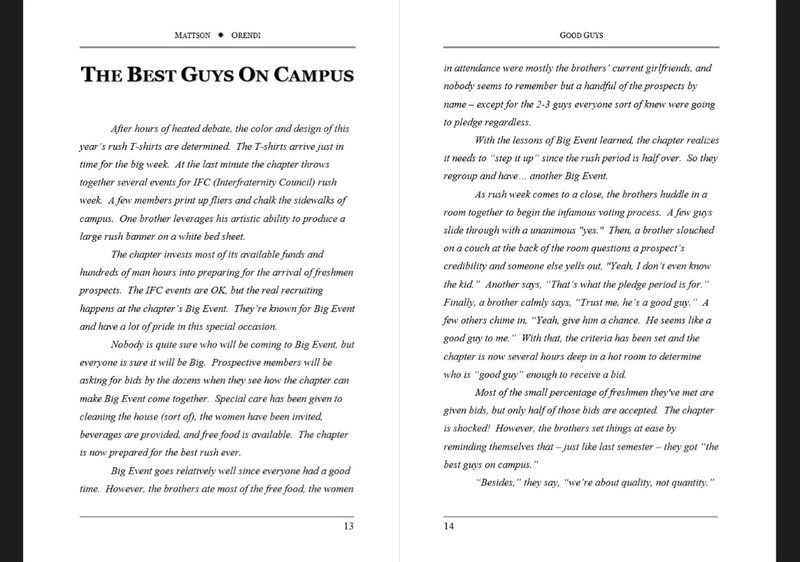 Most fraternity recruitment selection processes look an awful lot like the excerpt from our book, GOOD GUYS, in the image below (click to enlarge, read and enjoy!). When selecting your members, it is VITAL that you use a Values-Based Selection Criteria. Here’s an example. Choose men who are already living the values your organization espouses. Seek evidence that they’re already exemplifying the type of man you want your members to be. High quality people make high quality organizations. O.K., you’ve MET a bunch of guys. You recorded and managed their relationship with the chapter using your ChapterBuilder Names List. You deepened that relationship through Small Activities. And you voted on the guys you want to give a bid to using a Values-Based Selection Process. Now it’s time to close the deal. Start with a “Pre-Close.” See the video below for instructions, or check out this free resource. A proper Pre-Close will guarantee your chapter gets 100% bid acceptance! Then, close the deal. The best way to “Make the Ask” is to make it a man-to-man conversation. It’s a big deal. You’re asking him to join for life. Lay out the expectations of membership. Make sure he understands what is being asked of him. Reinforce the “pre-close” question. If he’s ready, make the ask directly. “Will you join our group?” If he says yes, close the deal with a handshake and a signature on a bid card. Fraternity recruitment is not complicated. Meet people, build relationships, keep track of all your interactions, when it’s time vote on guys thoughtfully, then close the deal. Remember, we’re here to help. Reach out to Phired Up if you need advice, guidance, want some training or whatever. We’re here for you. Have a great fall!